If you’ve never been, IndieCade East is an all-purpose symposium on the art and design of videogames. It crams smartly curated exhibits, lectures and panels from experienced pros, and (yes) actual, playable games into a single weekend of forward-looking fun, and that’s “fun” in every permutation of the word, from the intellectual satisfaction felt by thoughtfully pondering a work of art, to the pure joy of playing a new and addictive game. Ferrari and his co-chair Toni Pizza have overseen a busy weekend that tracks the collision of art and games. If you are making it to IndieCade East this weekend, here are three things you shouldn’t miss. If you’ve been to a games festival, you’ve probably seen idiosyncratic games that use unusual devices or untraditional controllers to explore new paths in game design. Strange Arcade collects some of the best of those games from the festival circuit in a single exhibit. Expect games like Line Wobbler, a festival hit that transposes a dungeon crawler onto an LED strip, and Codex Bash, where you team up to decode an espionage thriller using giant red buttons that look like they’re from an old game show (or an old Staples ad). Definitely make time for Superhypercube VR, especially if you’re still a skeptic about virtual reality, and the hard to describe game “platform” Tripad, which is basically a cube made of soundboard touchpads made for DJs. 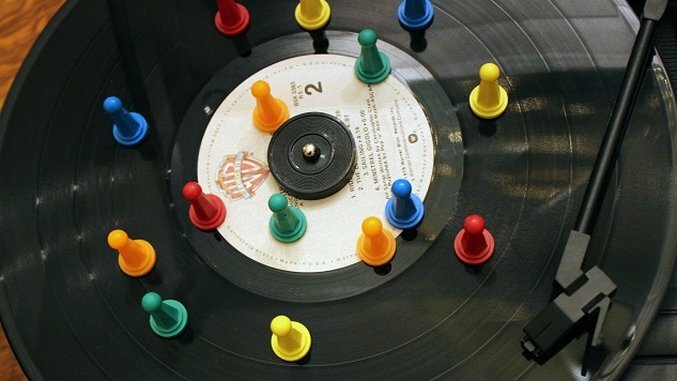 If you’re a fastidious record collector who cringes at the thought of scratches, you might want to avoid RainboDisko, a boardgame that uses a record player as the board. Most of the days at IndieCade East will be spent at panels, workshops and lectures. It might sound like typical conference fare, but the roster of speakers and events gathered together by this year’s conference co-chairs, Henry and Jennie Robinson Faber of Toronto’s Bento Miso and Dames Making Games, is anything but typical. You can check out the full conference schedule here. Paste’s pick to click: Sunday’s panel “The Last of the Red Hot Ryus: Male Sexualization and Desire in Games,” which was put together by occasional Paste contributor Todd Harper, and has a panel featuring Paste’s assistant games/comedy editor Gita Jackson, former Paste assistant games editor Maddy Myers, and Paste contributor Dante Douglas. Every year IndieCade East hosts the Night Games event, chaired by Greg Trefry of the game studio Gigantic Mechanic. Usually held on Saturday nights, it’s basically a big party full of fun and unique games. Expect beer, games, perhaps some prizes, and a great opportunity to blow off some of that conference steam built up over the first two days. Show & Tell is a chance for developers to get feedback for prototypes and in-progress games on Saturday and Sunday. The IndieCade East eSports Showcase runs all weekend, holding tournaments for a variety of competitive games. The Keynotes will feature presentations from Richard Marks, who helped develop Sony’s EyeToy and Playstation VR, and Kate Parsons, a video artist who collaborated with musician RYAT on the multimedia show Alt Mode, which debuted at Central Park’s SummerStage last year.